When it comes down to the best drill press, based on our research, we picked the WEN 4208 5-Speed due to its variation of speeds from 740 to 3,140 RPM, its adjustable work height and powerful 1/3 HP motor. 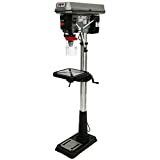 It is designed for 120v systems and has an 8-inch swing that makes your working process easier and simplified. For the highly-budgeted person, the WEN 4210 Laser might be a good choice for you. With a range of 600 to 3100 RPM for its speed, it can also be adjusted for up to 5 speeds like our top pick, but it has a laser to make things faster in the work area. Its length is 10 inches as compared to our top pick’s 8-inch drill. If you’re saving money in general, the Dremel 220-01 Rotary can be a great budget pick. As a benchtop drill press, this budget option has a convenient tool holder and also has an option for a keyless chuck. You can also find it compatible with various rotary tools as well. A drill press is usually used for industrial purposes. A drill press is a kind of drill that is meant to be situated on a table or workbench. It is not like your usual manual or handheld drill because it is supposed to be installed on a flat surface or work area, and is meant for better stability. Most of these are generally used for woodworking and metalworking as well. Woodworking requires you to be precise and fast on each measurement and hole that goes in different parts of whatever you are assembling. Both woodworking and metalworking share the same concept of precise measurement as well as accuracy, therefore needing a stable workstation for the job. That is where the drill press comes in handy. There are four general types of this kind of woodworking tool: benchtop, a mortise tool, magnetic and stationary. All of them have their own pros and cons. The benchtop drill is more ideal for use in woodworking projects. Benchtop drills also usually have less power in terms of their motor, thus making them more ideal for lighter DIY projects at home. On the other hand, the magnetic drill is ideal for vertical metal parts and anything that involves metalworking. Mortisers are also great for woodworking because they are designed for that task. Stationary ones do not move and are quite different from benchtop and magnetic drills, for that matter, hence they can be a bit pricier than them. Many brands of power tools like WEN and Skil are known to sell such drill presses. They all have different prices because of the varying features, speed options, length of the parts and the durability, which might also affect the warranty. It really pays to choose the right model that is best for your needs, as not everyone is a woodworker who does it for a living – some just do it for the spirit of DIY fun as a hobbyist. This tool can be used for both wood and metal. Like with most power tools, the speed option is a crucial feature that must be seen in the tool. Whether you use the tool at home or for a living as a woodworker or metalworker, it pays to know the right speed for the job. Too much speed can cause your work to be imperfect and rough on the edges, while too little speed can make the item of work become less toned as well. Too little speed can also waste a valuable amount of time ahead. Different bit lengths can affect performance. The length of the drill part of the tool can also affect the price and performance. Something that has more reach is definitely worth the extra money because you will be able to work on more kinds of projects with it. However, you should also know if you will really be using such a tool in the future more often or else it will be left unused and forgotten when the time comes, and your investment will be for nothing. Its motor should be strong enough depending on what you want to work on. The motor strength is what keeps a constant speed for your drill press. You have to make sure that you get a good motor strength so that it will not compromise your work’s finishing touches, especially for a client project, whether it’s for woodworking or metalworking. Type of tool: currently, there are four general types of drill presses: benchtop, mortiser, magnetic and stationary. Benchtop and magnetic ones are the most common, while stationary ones are rare because they are pricier and are more intended for specific purposes of cutting holes. Mortisers and benchtop style machines are more intended for woodworkers while metalworkers can make the best out of a magnetic style. Length of the drill part: a longer length would be more useful for more projects to come, especially if you will use it for professional or industrial purposes. The drill parts should also be durable aside from having the sufficient length needed for a project. The strength of the motor: this is usually measured in HP or horsepower. An easy start is greatly expected from any kind of power tool so that you can get working right away with any project that you intend. Intended use: Some of these tools are ideal for DIY or home use while others use them for commercial applications or purposes. Home use tools are usually not that powerful as they only have a few HPs for their motor, while the commercial use ones can be made for bigger DIY projects that may take weeks to finish at hand. Voltage: the voltage system used may depend on the system that is currently being used in your country. For instance, Consider the rating of the said tool if it is applicable to your area since not all areas in the world have a 110v system. For instance, Europe uses 220v and so does some parts of Asia, while the rest use the 110 or 120v system. Ease of operation: You need to know if the machine is simple to operate so that you can be able to use it with the only a few mechanisms that should not take too much of your time. The controls of the drill press should not be too complicated for you to cut through the different parts of your wood or metal material for work. Included laser: some of the more expensive ones have included a laser in the system. This makes the whole mechanism and tool much more expensive than the regular ones, but are far more efficient in terms of accuracy and getting the job done quickly and neatly. Warranty policy: with the warranty policy, you have to know which parts of the machine or tool is covered by the warranty, so that you will know which parts to take care of. If you want the best drill press out there that’s balanced in value and in functionality, the WEN 4208 5-Speed looks to be a great option for you. Its spindle travels up to 2 inches so it is pretty decent for most minimal, hobbyist and shop projects for woodworking and metalworking. It has variable speed so it will not wear out the motor too fast, unlike other units. With its powerful 1/3 HP induction motor, you can get the job done with its swing of 8 inches that can be adaptable for various projects. It is also easy to put together as a unit to work on your garage or workstation. It can produce repeatable results with the locking linear depth stops that ensure not only safety but also accuracy in the long run. It has a working height of 23-1/8 inches so it has a good height that won’t be in the way of smaller areas. You can also make right angles with the 45° left and right beveling system, which is important for most woodworkers. It also comes with a 1/2-inch keyed chuck so you can get started right away. Many reviewers have noted that this machine has no spindle run-out, which is convenient. Bearing 2.3 amps of power, this powerful machine works on 120v systems with sufficient power for most hobbyists and those working with metal, wood and plastic materials for their project. You can choose from 740 to 3,140 RPM of speeds and you can place it onto any 6-1/2 x 6-1/2 inches of table size for the best comfort and stability. Its base platform swivels and it has an onboard key storage for convenience. While not entirely a deal breaker, the WEN 4208 5-Speed does not have a laser in its system, but our step-up pick does, and that’s why it is pricier than our top pick. For a step-up pick, we believe that the WEN 4210 Laser may be a good choice for you. It has 10 inches for its swing as compared to our top pick, making it pricier and more intended for industrial use. Compared to our first pick, it has a laser to speed things up during your working spree. It has a depth stop that not only ensures safety but also upholds accuracy in every project whatsoever. It also has 2-1/2 inches for the spindle travel for a better reach. You also won’t have to disturb the kids when they sleep due to its low noise levels that will keep you work-oriented throughout the hours. It also bears 3.2 amps of power for its motor so it is plenty powerful for most projects. 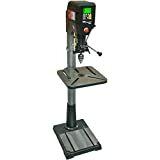 For those needed something more accurate and are willing to spend the extra dough to get it, the 600 to 3100 rpm choice for this drill press will definitely make their day as a DIY craftsman great. It also uses a 1/2 inch chuck for convenience with over 5 speeds to choose from. It can easily drill through hardwood with fewer problems and it stands at 26-1/2 inches to give more space above. Being easy to assemble the unit, this system has a 45-degree worktable can bevel right and left for better mobility and flexibility on the go. It has a cast iron work table as well so you can expect it to last for the many years to come. Greatly applicable for a table size that measures 7-5/8 x 7-5/8 inches, this unit has an x-pattern laser with laser light crosshairs, which makes it pricier. It also includes a work light and a key storage to add to its convenience. As our budget pick, the Dremel 220-01 Rotary has the right features for the price, such as the telescopic adjustment on the flex shaft tool stand from 16 to 29 inches. It is made with a metal base and rods that work well for those who just need a decent drill press at hand. It also works for making those perpendicular and angled holes with good accuracy. The Dremel 220-01 Rotary also has a unique tool holder up to 90 degrees horizontal so it is a multipurpose tool to help you get many angles available for your project. It retains a controlled movement, as described by reviewers, and even has a storage for drill bits to make it convenient for when you are working on a project and too tired or lazy to organize your stuff. If you want something that gets the job done, although not a high-priced item, this one is a great articulating drill press to start with. It provides you with easy access to tools you need to change and can be even used for drilling into the leather with no problems at all. You can even use it for certain sanding and polishing tasks. With this machine, you can even use the longer stroke for almost any bit that you may have at home or in the workshop. This package includes a mounting wrench and many accessories needed. At 3.2 amps, if you want something with 5 speeds available for different scopes of projects, the SKIL 3320-01 may be a good choice for you. This machine is definitely great for your average 2×4 treated wood and produces low noise levels at that point, making the joy of working in peace a thing of the present. It has a laser alignment tool as well to keep the results of your woodworking or metalworking as accurate as possible without wasting time. Its left and right tilting work surface up to 45 degrees can be helpful for those who need to get into the most awkward angles with their projects. The bench top design includes a 10-inch depth for a better reach. It is quite easy to assemble due to the simple directions and delivers 570 to 3,050 rpm of speed, depending on its belt is driven power. The SKIL 3320-01 also features a small radial run-out for the mast, according to those who have used it, and has a safety bump-off switch to keep the user in the right position. This machine also accepts larger bits so it can be useful for projects that are pretty large-scale. With 2-sided motor tension adjustments, the unit also has an adjustable depth stop, both of which add to the safety and the adjustability. It has a 1/2-inch keyed chuck like almost everything else of its kind but has no obvious wobble whatsoever. Meeting the csAus certification standards, this powerful unit has a 2-beam laser for better accuracy. It runs on 2 AA batteries for the laser and other components and can be a great woodworking and cutting companion. It is backed by a limited 3-year warranty. If you want a stationary drill press and are willing to go the extra budget for it, the WEN 4225 may be a good choice for you. It will grip a 1/16″ bit just fine, according to those who have used it, and features a convenient key storage for better tool organization. What makes it stand out from the competition is the digital speed readout, which can be convenient for accuracy. At 4 inches for the spindle travel for a better reach, it has a 5/8 inch chuck capacity, which is sufficiently better than the 1/2 chuck capacity of other brands. It can be set from 280 rpm to 3300 rpm of speeds and has a locking depth gauge for accuracy and safety at the same time. With a 12 x 12 inches cast iron work table, it has a sufficient footprint for those who don’t have a lot of space at home. It is also available in 15-inch and 17-inch models so you can choose which model is more appropriate for your working style. Backed by a powerful 8.6 amp induction motor, the WEN 4225 even has a precision laser for added accuracy in any project you may have. As a floor standing unit, it comes with a work light to help speed up your projects in the wee hours when everyone’s asleep and you’ve got a deadline at hand. It has a 15 inches swing as compared to those with lower swing measurements. You can use it to pierce through 4×4 boards with fewer problems – powerful for a machine that stands at 63 inches high. It is backed by a 2-year warranty. If you want a magnetic drill press then you can count on the BLACK BLUEROCK BRM-35A to do the job for you. It has an average drilling capacity of 7/16, 1 1/2 and 2 inches depending on the type of material that you are working on. Since this unit is a magnetic one, it is more suited for those who are into metalworking rather than just woodworking. As a multipurpose unit, it is also a tool holder so you can use it for that purpose as well (for the organization). With up to 1 inch of bit capacity with step drilling, this can help you to step up your game and work faster on projects, along with the fact that a standard 3/4″ Weldon shank is used. This unit is great if you are using it only occasionally and not for industrial use (e.g. for home projects only), but it is nonetheless powerful. It has a 1-3/8″ distance from the spindle to the base, which can be seen as a good number for units of the same price. It comes with a free chuck and also includes a safety chain. Ideal for hobbyists and DIY people, it works on 110v systems and has a speed of 570 rpm. It also comes with an oil bottle and storage case. With a speed of 50 to 5500 rpm, if you want a direct drive motor unit then your best bet would be the NOVA 58000 Voyager, as it is a digital style unit that can n even be further improved with its firmware upgrades for the machine software. Specifically designed for woodworking, its DVR motor is at 1.75 hp to 2 hp and is a high torque motor. You can also convert the machine between inch and metric measurements for convenience, depending on which unit you often work with. You can also have the unit tilted from -45 to +45 degrees depending on the project you are working on. This machine also includes a 2mt quill taper in addition to the 6-inch quill stroke and 18-inch swing, which is powerful for similar units of its kind and price. With the tilt/vibration sensor to keep you safe, you can totally depend upon this machine not only to get the job done but also to keep your workplace safe and sound. At a 9 inches distance from the center of the spindle to the column, this unit can handle wood, metal, glass, plastics, and others. It is powered by a computer-controlled motor, as compared to others that only have a simple motor in its machinery. Its warranty policy is as follows: a 2-year full replacement warranty for the motor and controller and a 5-year full replacement mechanical warranty. If you want something that also has a work light to keep you comfortable in the late hours, the JET J-2500 15-Inch can be a good choice for you, with a table that tilts up to 45° for comfort in awkward positions. It also has an enclosed quill to keep it durable for the years to come and it has a drilling capacity of 5/8 inch on cast iron and 1/2 inch for mild steel. You can be able to work with speeds from 200 to 3,630 rpm. It also had a total of 4 heavy duty ball bearings in the assembly which adds to its stability and it also has a ground steel column has a good diameter for better support for the base and table. You can also count on accuracy due to the large quill design. Withstanding up to 44 pounds of work table weight capacity, it has a cast iron head for added durability with up to 16 speeds for adjusting onto your project needs. It works on 115v systems and has a good 24-inch table travel for better reach. The Craftsman 10 in may be a good choice if you intend to have a laser tool with the machine for faster work time. It also allows you to easily align the brace with the scaled steel fence. It works great for gunsmithing as suggested by people who used it due to the included laser sight. It has 620 – 3100 rpm of speed choices for its 5-speed settings, which can be great for a handyman as well. The unit bears 3.2 amps of power on its 120v system motor so it is quite powerful. It can accept up to a 1/2″ shank so it is pretty good for its reach. With a durable cast iron table, this machine is easy to adjust due to the rack and pinion table elevation, which can help speed up your work process, and it also goes about 2 1/2 inch deep in one pass or its stroke length. 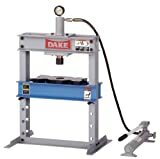 Measuring 23 x 18 inches in its dimensions, the Dake B-10 Model is a good choice if you want something that has hydraulic power. With a working height of 36 inches, this unit is pretty good for those with medium-sized headroom for their garage and want to save up on power by using hydraulics. When you have limited space, this can be a great hydraulic bench press for your workshop. It has a total of 4 holes at 7/16″ for bench mounting and it can accept 10 tons of loading capacity, which is plenty powerful for something of this size. For the package, it already includes hydraulic oil so you can get started. It also includes 3/8″ holes for the base mounting so it is easy to install and mount. Moreover, it also includes accessories like a ram nose, 2 table plates, and a flat ram nose so it is an all-in-one package. There were others that did not make it to the list because they lack sufficient power for most woodworking and metalworking projects. They were also not very stable to work on, as said by the reviewers, thus making them less efficient for both DIY work and industrial work. Q: What features can make a drill press stand out from the rest? It is important to have stability in this kind of machine. Speed Speed refers to its RPM or rotations per minute. The speed of this machine is important if you want to work on your projects faster so you can move on from one item to another in a breeze. Speed can be crucial for getting industrial jobs done as well. Variable speeds can also be important to keep the machine’s motor from overworking itself. Keyed chuck size The usual size of the keyed chuck is 1/2 inch, but there are also some that have a bigger size, such as 5/8 inch. A good sized keyed chuck can help you to stay safe while you are operating the machine. Motor power Motor power is measured in HP or horsepower. The more horsepower the motor has, the better it could perform for industrial purposes. It also pays to have good motor power so that you can get the job done quicker. Construction of the parts Durability on the parts in terms of construction is important. A cast iron base may be what you’d be looking for if you want something that can last for almost a lifetime with proper maintenance. Table size and height This refers to how much room it can take up when you set it up on your work table. This is crucial for those who do not have enough room for a drill press in their work area and still need to work with this kind of machine. No wobbling Having great stability is crucial to have a smoothly drilled surface and item of work. The machine should have a stable base and parts that do not add wobbliness. A lack of stability can compromise your safety and may also ruin the quality of your work. Price A press that has a good price can also mean a lot for those who don’t want to spend a fortune for a press, especially for hobbyists only. Q: What are the most common chuck sizes? Drill press chucks can have different sizes. 1/4 inch This size is ideal for light duty work, such as for household repairs. 3/8 inch This one is ideal for those who have medium duty work, such as for a home shop or DIY work. 1/2 inch This one is suited for those needing a powerful machine and bit combination. It is ideal for bigger projects. Q: Can a drill press be powered by an air compressor? Air compressors can sometimes power up this tool. A: Yes, there are models of drills and presses that can be powered by pneumatic power, hydraulic power or with the use of an air compressor. This is because most power tools can be powered by compressed air. This is ideally used for use in industrial purposes and big projects where normal electricity might be too costly for a power source. Q: What other machines can be powered by an air compressor, aside from the drill press? Q: How is a reloading press different from this kind of woodworking tool? Intended use Also called a turret press, ideal for metalworking and is usually CNC controlled. This kind of press is ideal for both metalworking and woodworking. They can either be manual or computer controlled. Q: How is a hammer drill different from a press? The hammer drill is ideal for masonry work. Intended use These are ideal for concrete materials, masonry, bricks and the like. These are ideal for metalworking as well as woodworking. Power They are usually much more powerful since they are intended for masonry work. They are less in power but still powerful since they will be only used for woodworking or metalworking. Q: How is a pancake compressor related to this kind of woodworking tool? A: The pancake compressor can be used in conjunction with your drill press since it is also a kind of an air compressor. Air power is sometimes much more powerful, economical, eco-friendly and more suited for industrial use as compared to gasoline, fuel or electricity. Q: How are tire jacks related to this kind of woodworking tool? A: There are some instances where a tire jack can be used to help raise the bed of a drill press. Tire jacks may be used in cars and automobiles but they can also be used, if possible, for larger sized drill presses. Although, there are only a few tire jacks out there that is capable of handling this kind of task, as most will be found in automobile work. Q: Aside from this kind of woodworking tool, what other types of drills are out there? Corded and cordless ones are common types of this tool. Corded This one is ideal for added power and is intended for medium to large scale drilling projects. Cordless Battery operated at the very most, this one is intended for light duty tasks and DIY stuff at home. SDS or rotary hammer This type is ideal for masonry and harder materials because it uses specially designed bits. Impact driver This one can be used to drive in screws onto any material in the easiest way possible and in the most secure way as well. Q: Aside from the drill press, what would be another woodworking tool that can help to drill holes? A: For drilling holes, a wood router can also be a great equipment of choice because it can also be used for other wood shaping tasks such as trimming and cutting. If you are on the woodworking side of things for your projects, this can be a great tool to have along with your drill press. Q: Is it possible to build your own drill press? A: While it may sound tempting to build this kind of woodworking tool, it can be costly in the long run. This is because you need a lot of force and materials to make it work. Hand machines cannot work properly because they need the real materials of the said woodworking tool. It is more economical to buy yourself a separate machine for a cheaper price than to build one from scratch. Q: Where can I use a magnetic drill? Construction Ideal for steel fabrication, general building construction and rebuilding bridges. Can also be used for building ships. Mining and oil fields This can also include offshore use as well as for pipeline maintenance. Industrial use This includes power utilities, machinery riggers, maintenance and the like. Repair and restoration This includes welding shops, mobile repair shops and the like. Automobile industry It can be used for making RVs, trucks and other unique vehicles which are usually larger for utility purposes. Q: Where can a countersink bit be used? A: A countersink bit can only be used in a drill press, as opposed to a manual version of the tool. This is because the countersink bit gives a lot of torque which can be needed for powerful work applications, such as those for near-industrial quality requirements. Q: What are the different parts of this tool? Head The main part that drives through your item. Base This is where the whole press stands on for stability. Column This is the part that is located in the middle of the machine. Spindle The spindle moves along with the chuck in the machine when used. Motor The motor used for this machine or tool is an induction motor that is usually from 3 to 6 HP. Table A table is important to make this press work, as it cannot be used without it. Q: What are the pattern sizes that you can make with this kind of woodworking tool? A: In terms of working with this specific tool, the circular patterns you can possibly make when combined with a circle guide, can be between 1/2 inch and 30 inches in diameter. This roughly depends on the model of your woodworking tool, however, as not all of them are ideal for large-scale applications. Q: What are the most common bit sizes that can fit with this kind of press? A: This press or woodworking tool can possibly take most 2.3 mm sized bits out there. Again, this depends on what is recommended by your manufacturer and the material that you use. For bigger materials, you may need something that is longer in terms of its total length. Q: What are some common materials you can use for this press, aside from wood? You can use this tool in a workshop for a number of materials. Q: What is the average horsepower of this kind of tool? A: You will most likely encounter a horsepower (HP) of 1.75 to 3 HP for those that are meant for home and medium-duty use. However, for heavy duty purposes, you will most likely have a machine that has a high HP of about 4 to 6 HP. Q: What metals can be used for this kind of tool bits? Different bits can have different materials used for them. Carbon steel They are soft, malleable and can easily cut wood. They are, however, not as durable as higher grades of steel. HSS High-speed steel is an improved version of carbon steel which can be ideal for hot temperatures. Cobalt Cobalt can be used for stainless steel cutting and are very good at withstanding high heat. Zirconium They are ideal for decreasing the friction so that you can be more accurate when you work on the machine. Titanium Titanium is very strong and can be heated to higher temperatures, making it quite a beast when you use it in the machine for almost any material whatsoever. Q: How can a threaded insert be installed in this kind of tool? A: This kind of woodworking tool is usually made in conjunction with a threaded insert. It is usually attached to the nose part of the machine and ensuring that the base material is inserted with the press and the insert. To wrap things up, the WEN 4208 5-Speed is our chosen winner due to the powerful 1/3 HP motor, variation of speeds from 740 to 3,140 RPM, 8-inch swing and adjustable work height. It might not cater to people who are looking for something with a laser but for the balance of price and value, this is a great choice overall. Thanks for showing some of best drill press in the market. My favorite is WEN 4214 12-Inch Variable Speed Drill Press. I loved of its power, versatility, workload. With its amazing strength, it will amaze you every time. Through any hard work and it will never let you down.